In recent years, studies on violence in antiquity have become a burgeoning field. Within this topic, investigations into the penal practice in ancient societies still seem to make up the main part. Olivia F. Robinson is long since acknowledged as a specialist on this interesting area, known for her publications, such as The Criminal Law of Ancient Rome. The reader, therefore, may safely expect results both valuable and stimulating from her latest monographic contribution to the field. The approach of this book is different from previous ones providing a universal, descriptive picture in that it largely deals with case studies. Since the choice of cases is made based on what is reported (and still extant today) in detail, most of the relevant source material is a literary one, added to, where applicable, by inscriptions. Each case study is attributed a chapter of comparable length. All of these cases apparently have in common that they show the Roman Empire and its legal institutions in the extreme. In contrast, petty crimes are only summarily dealt with. These cases are eventually compared with Roman society's attitudes to crime and punishment. This approach seems, in fact, new and 'fascinating for the historian' (6), but the reader should not expect to find a reference work of Roman criminal law here. Chapter one, "The Bacchanalian Affair", gives a circumstantial account of how this early religious struggle, the origins of which might have been exaggerated strongly by Livy, was triggered and dealt with by the senate. Although many thousands worshippers were imprisoned for the purpose of investigating their actions related to the cult practice, they could be executed only for having been convicted of criminal actions, not simply because they had participated in the cult. Chapter two "Cicero, Murder, and the Courts", considers Cicero's few murder cases. In a digression, Robinson explains that the Romans never had a state prosecution service but relied on private individuals bringing offences before the criminal courts. The chapter includes a detailed and interesting history of the poena cullei (punishment for parricide). "The Trial of Cn. 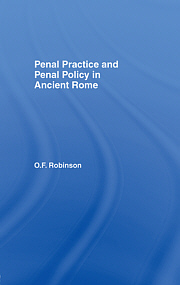 Calpurnius Piso in AD 20" is found by Robinson to be significant for our view of the political nature of Roman attitudes to penal practice and penal policy. In addition to Tacitus' biased account, the SC de Cn. Pisone patre is discussed as providing sidelights on the historian's methods. The chapter includes a discussion of the maiestas-law and of the delators (private informers). As a result, Robinson finds no miscarriages of justice, despite Tacitus' suggesting such. It follows the chapter "Pliny and Repetundae Trials before the senate", which includes a caveat: "The series of trials, described straightforwardly by Pliny, is less informative than one might have hoped on Roman attitudes" (97). Instead, Robinson concentrates on highlighting the criminal procedures during the reign of Trajan. In conclusion, Robinson does "not wish to go so far as seeing a golden age here, but this period was probably the nearest approximation to it" (98). 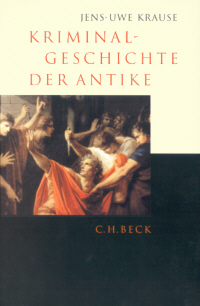 Chapter five, "Acta Martyrum Christianorum: The extension of torture", concentrates on the legal practice of the Christian trials on the basis of what is reported particularly in the more trustworthy Acts of the Martyrs from the pre-Christian period. Torture was frequently applied in trials against Christians, which raises the question of whether or not this was a legal procedure, for the use of torture was largely limited to slaves under interrogation. Most martyrs, however, seemed to have been from the lower classes, the humiliores, which were not exempt from torture in the classical period, or if not so were members of an illegal organization to which exceptions applied. From this and other procedural details, it is concluded that despite the apologists' claim of the injustice of such events, the rules of criminal law procedures were mostly followed correctly. In the chapter "Trials for treason and magic in the fourth century", Robinson (as most other scholars) regards magic as clearly linked not only to religion, but also to science and philosophy. The chapter includes a summarily history of book burning. The final case-study-chapter "Justinian the legislator" compares the Justinian to the Theodosian Code. It appears that changes were made only to the less savage and the less rhetorical, towards a casuistic rather than dogmatic approach, which can be attributed directly to Justinian. The final chapter draws on Roman philosophers, particularly Seneca, providing a glimpse on ancient attitudes to crime and punishment. Additional topics are covered, e.g. that punishments become harsher from the republic to the empire, which seems to be the communis opinion of the research ever since the works of P. Garnsey. Robinson discusses the various institutions in charge of detaining and executing criminals, both citizens and non-citizens, which were treated much differently in any pre-industrial society. Street crime, which was ever punished the most severely, was closely associated with non-citizenship of the offender. In the principate, capital punishment of citizens became more and more common apparently simultaneously with the numerical rise of citizens both in the provinces and the city of Rome. In sum, the Roman penal system was remarkably static and much more reactive to a transforming society (marked particularly by bloody spectacles and the changing range of citizenship) than taking into account intellectual achievements of the philosophers or, later, Christianity. Despite this rather negative end, from Robinson's discourse it appears that the Roman legal system seem to have functioned quite smoothly even in the time of crisis or transition. Overall, the book does match the high standards that the reader can expect. Robinson is especially strong when it comes to discussing the various legal backgrounds and institutions of law enforcement in history. The Indexes, particularly the index of sources, are also very helpful. 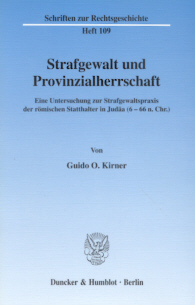 Although not a reference book on the topic, it does contribute significantly to rendering the legal systems of Western civilizations more understandable from their ancient precursor and it contains many fine observations on the various topics discussed. E.g. E. Cantarella: I supplizi capitali in Grecia e a Roma (Milan, 1991). P. Garnsey: 'Why Penalties Become Harsher: The Roman Case, Late Republic to Fourth Century Empire', in: Natural Law Forum 13 (1968), 141-162. R. Rilinger: Humiliores - Honestiores. Zu einer sozialen Dichotomie im Strafrecht der römischen Kaiserzeit (Munich, 1988). See Tac. Ann. 6.19; Cass. Dio 57.22.5; 59.18.1-3; 60.18.4.